An avid academic and aspiring scientist, Edward Banks, Lord Watson is pleased to find that he won't have to bother with the nonsense involved in courting a young lady. Young and naive, it doesn't take much for her social-climbing father to convince Regina the gentleman she's to marry has requested her hand out of love, but devastates her when she learns the truth. Now, it's up to a gentleman who's more comfortable in a conservatory than a drawing room to prove to Regina that she's more than just the proverbial sacrificial lamb that helped gain her family their foot in Society's door and that he - if no other gentleman - is trustworthy. But he just might be the one doing the learning as he'll be forced to acknowledge that sometimes the most combustible elements aren't the ones you control, but the ones you don't. In this novel, a belief based on a lie left uncorrected leads to the misunderstanding that is the impetus of the plot. I like it that the hero has to work for the survival of the relationship, and the heroine gains strength and a belief in her own self-worth. There is growth in both characters. But I do have a problem, though it is not unique to this book. The girl saw him from the top of the stairs and decided she was in love with him. Her roommate's brother introduced them, they shared perhaps 10 words before a crisis interrupted the conversation, then she pined away for him for the entire Season. I hate the "love at first sight" plot device. Why can't it be a tingle at first sight, or just outright lust? Well, I guess girls didn't know sexual interest from love back then, but wouldn't they have the sense to want to know the guy before committing to him with their whole hearts and/or other body parts? At any rate, this was a fun listen. Words like, gentle, kindness, thoughtfulness, and respect come to mind as adjectives in describing the male lead in this book, Edward. I appreciated the maturity in which the characters were portrayed. Rose Gordon is a wonderful author. I would definitely recommend this book. The narration is well done and each character has a clear and distinct voice. What made the experience of listening to His Contract Bride the most enjoyable? Very enjoyable, simple, romantic story. The characters and background deserved more depth than they received. You're killing me, Rose Gordon! 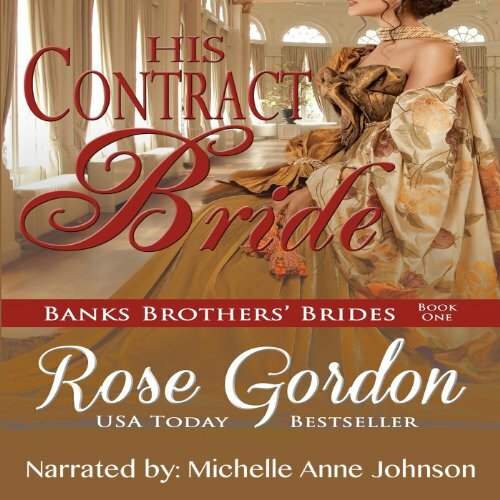 Would you consider the audio edition of His Contract Bride to be better than the print version? I was listening to the audio edition!! What other book might you compare His Contract Bride to and why? I hate this question... Books aren't meant to be compared unless its within a series or authors work. This was a almost typical regency romance... but just that. What does Michelle Anne Johnson bring to the story that you wouldn’t experience if you just read the book? A voice... the enjoyment of listening to it and feeling comfortable with the listen the whole way thru. That alone says a lot. Several. But the moment when they finally turn the corner and get it, at last. Its been a few days since this listen, a couple of books ago. But I still feel that it was a overall smooth story, a comfortable listen. I enjoyed the ease of it. There was no truly great mystery or any overwhelming hurdles... but it was sweet. A LOVE story! Worth a credit? I don't know. If your looking just for love then maybe.